Toronto FC supporters gather in Liberty Village before the Eastern Conference Final match in 2017. Image by Dennis Marciniak of denMAR Media. Toronto FC supporters lighting flares and smoke in front of BMO Field during that march to the match ahead of the Major League Soccer Eastern Conference Final. Image by Dennis Marciniak of denMAR Media. 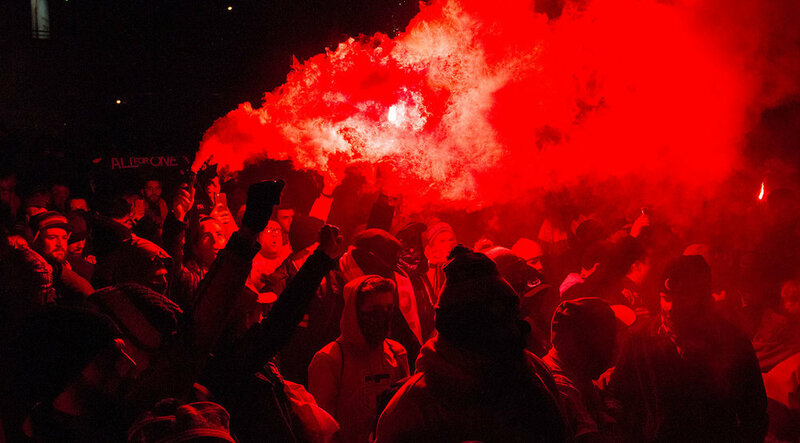 TFC supporters lighting flares and smoke in front of BMO Field during that march to the match ahead of the Major League Soccer Eastern Conference Final. Image by Dennis Marciniak of denMAR Media. Jozy Altidore and Jonathan Osorio taking practice shots before a MLS playoff match in 2017 at BMO Field. Image by Dennis Marciniak of denMAR Media. 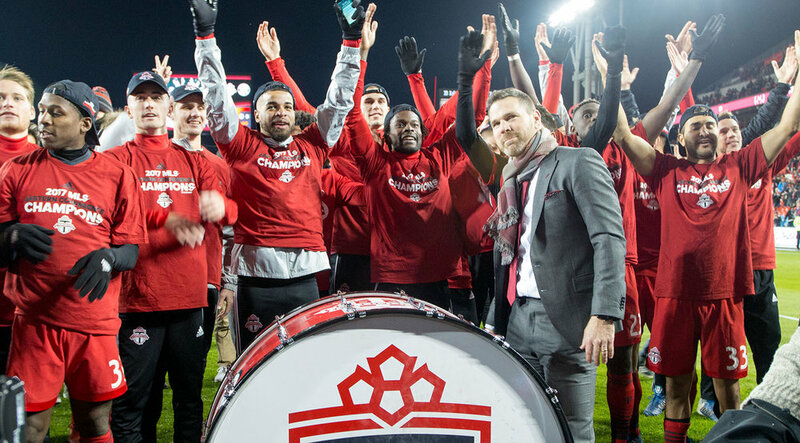 The Major League Soccer Eastern Conference Trophy was up for grabs at BMO Field between Toronto FC and the Columbus Crew in 2017. Image by Dennis Marciniak of denMAR Media. Toronto FC oberserving the national anthems just ahead of kickoff during the opening ceremonies. Image by Dennis Marciniak of denMAR Media. Toronto FC supporters in the south end of BMO Field raise the scarves up high during the national anthem on November 29, 2017. Image by Dennis Marciniak of denMAR Media. Sebastian Giovinco is taken down to ground as Ismail Elfath looks on. Image by Dennis Marciniak of denMAR Media. Justin Morrow avoids getting studs penetrating his skin as a Columbus Crew player makes a dangerous attack on the ball. Image by Dennis Marciniak of denMAR Media. Victor Vazquez takes a penalty kick that is saved by Columbus Crew's goalkeeper Zack Steffen during the 2017 MLS Eastern Conference Final at BMO Field. Image by Dennis Marciniak of denMAR Media. Jozy Altidore is taken down to the ground during the first half of play. Image by Dennis Marciniak of denMAR Media. A Toronto FC South End Supporter covers his face as smoke fills the stadium during the 2017 Major League Playoffs. Image by Dennis Marciniak of denMAR Media. Columbus Crew goalkeeper Zack Steffen punches the ball away from danger as both Toronto FC and Columbus Crew crowd the 18 yard box. Image by Dennis Marciniak of denMAR Media. Jozy Altidore in pain on the ground due to an ankle injury. He would stay on to score the series deciding goal. Image by Dennis Marciniak of denMAR Media. Columbus Crew goalkeeper Zack Steffen collects the ball out of the 18 yard box. Image by Dennis Marciniak of denMAR Media. 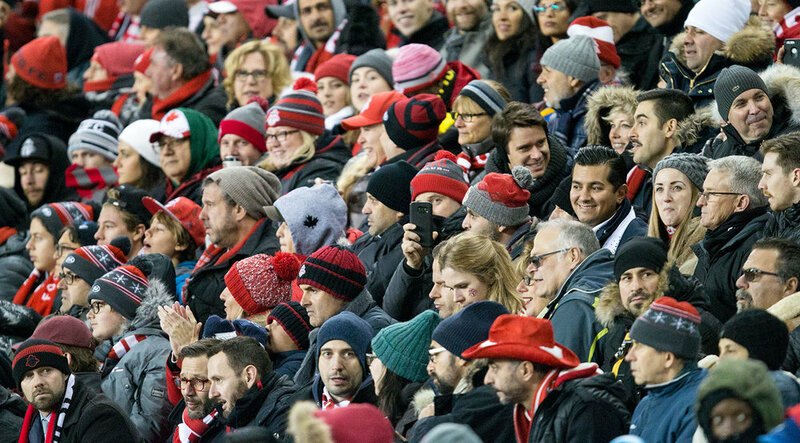 Toronto FC supporters look on in the stands as play continues in the second half of the Eastern Conference Final at BMO Field in 2017. Image by Dennis Marciniak of denMAR Media. Jozy Altidore about to kick the ball into the back of the net scoring the series deciding goal at BMO Field during the 2017 Major League Soccer playoffs. Image by Dennis Marciniak of denMAR Media. Jozy Altidore scoring the game winning goal for Toronto FC during the 2017 Eastern Conference Playoffs. Image by Dennis Marciniak of denMAR Media. Jozy Altidore celebrating the series winning goal that would take Toronto FC into the 2017 Major League Soccer final. Image by Dennis Marciniak of denMAR Media. South end supporters celebrate the goal with Jozy Altidore. Image by Dennis Marciniak of denMAR Media. Toronto FC and Columbus crew players looking to get to the ball during a MLS playoff match in 2017. Image by Dennis Marciniak of denMAR Media. 2017 Major League Soccer coach of the year Greg Vanney yelling instructions to his squad during the second half of the Eastern Conference Final at BMO Field in Toronto, Canada. Image by Dennis Marciniak of denMAR Media. Justin Morrow on the ball as a Columbus Crew player anticipates which direction he will go. Image by Dennis Marciniak of denMAR Media. Sebastian Gioinco looking towards the sideline for a throw in during the Eastern Conference Finale in 2017. Image by Dennis Marciniak of denMAR Media. Armando Cooper trying to get to the ball before the Columbus Crew goalkeeper can get to it. Image by Dennis Marciniak of denMAR Media. Toronto FC celebrating the advance to the 2017 Major League Soccer Finale with the Eastern Conference trophy. Image by Dennis Marciniak of denMAR Media. Your 2017 Eastern Conference Champions Toronto FC. Image by Dennis Marciniak of denMAR Media. Greg Vanney at the drum celebrating the Eastern Conference final win with the south end supporters groups. Image by Dennis Marciniak of denMAR Media. Michael Bradley and Drew Moor celebrating the Eastern Conference Final win with loved ones on the pitch at BMO Field in Toronto, Canada. Michael Bradley throwing his son into the air as streamers thrown during the match stick to his feet in celebration of the 2017 Eastern Confernce Final win in 2017. Image by Dennis Marciniak of denMAR Media.